How Are Women with Parkinson’s Different than Men? What image comes to mind when you hear someone has Parkinson’s Disease? I am sure it is not what you would have seen in Houston at the Women and PD TALK National Forum last week. In a little over 2 years from concept to fruition, the Parkinson’s Foundation’s Women and PD TALK initiative held 10 regional Forums in the past year, and a final National Forum in Houston last week. 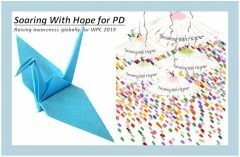 Three years ago, at the Parkinsons Disease Foundation’s (now Parkinsons Foundation) Women & PD Initiative conference that I was privileged to attend, one of the key take-aways was that there are disparities in research and care between women and men with PD. To date, there had not been any studies to look seriously at these disparities and we wanted to know what could be done to improve the care and treatment of women with PD. A year later, Ronnie Todaro, VP at the Foundation who had led the Women & PD Initiative, applied for a PCORI (Patient Centered Outcome Research Institute) grant to help fund Women & PD TALK. Because the grant required patient involvement, I was honored to be named a co-lead on the project, along with Dr. Allison Willis, Assistant Professor of Neurology, Perelman School of Medicine, University of Pennsylvania. We worked with Megan Feeney, M.P.H. Manager, Community Engagement at the Parkinson’s Foundation to put everything in place for this initiative. There were 10 regional forums, with sites chosen to represent large urban areas as well as more rural areas. Each forum leadership team included a Woman with Parkinson’s, a Movement Disorders Specialist or Neurologist and an Allied Health Professional. About 40 participants, both women with PD and Health Professionals attended each of the full day events. Breakout groups at the forums gave valuable information on Risk, Symptoms, Treatment and Care. 50 people, about a third of them women with Parkinson’s Disease, gathered in Houston at the National Forum to go over the findings from the 10 forums and begin to set some goals and create recommendations and action plans. There is too much to report here now, but there will be some specific recommendations to improve the care and treatment of women with Parkinson’s in the final report. There are a significant number of women with PD who are caregivers, taking care of children, elderly parents or sick spouses and there is no one to take care of them. Women tend to go to their doctor’s appointments alone, while men do not. In fact, women go alone to most things related to PD. Women do not go to support groups as often as men. Some reported that when they went, they were asked who they were taking care of. No one believed that they were the one with PD. Being treated dismissively by doctors. Told it was all in their heads, and in many cases, especially for younger women, it was because of hormones. Women need to connect to other women with Parkinson’s. There was a lot of talk about the need for mentors to be paired with the newly diagnosed, to make the disease less frightening and be there for them when needed. Exercise, Exercise, Exercise!!!! We can’t say it enough. And finally, can we get rid of that awful caricature of a man hunched over with PD and replace it with the photo above of 11 amazing women with Parkinson’s? Thank you Ronnie, Megan and Dr. Allison for giving me the opportunity to be an integral part of this team. A full report will be issued, with specific recommendations and strategies to improve the lives of women with Parkinson’s Disease, sometime in the spring of 2019. I am looking forward to sharing it with you. In the meantime, click here for the link for the press release about Women and PD TALK. Blame it on Parkinson’s? Or Not? I am recently diagnosed and new to your blog. I look forward to seeing the full report. Thank you for your involvement!